For the third time in Jamaica’s theatrical history, aficionados of social satire will be entertained with Di Fallen Angel An Di Devil’s Concubine – a riveting one-act play that portrays two indigent elderly women whose paths cross in the abandoned house they both inhabit. The play, directed by two-time Actor Boy Awardee, fabian thomas, opens Thursday, January 31, 2008 at the Pantry Playhouse. It one of a two-part theatrical magnum opus – TWO for ONE: an evening of theatre where one ticket gets you two shows. Originally presented in 1987 at the School of Drama, Di Fallen Angel An Di Devil’s Concubine was performed by Honor Ford-Smith and Carol Lawes, who created the characters in an improvisation piece, and which was later scripted by both actresses in collaboration with Eugene Williams, Hertencer Lindsay and Pat Cumper. This year’s staging is brought to life by actresses Nadean Rawlins and Hilary Nicholson and Noelle Kerr and Nyanda Cammock (the casts alternate). The play explores the issues of aging, homelessness and survival in skillfully crafted and humourous script in which the protagonists relate their own compelling and harrowing experiences in a journey which becomes cathartic for both women and binds them together as they share painful secrets. 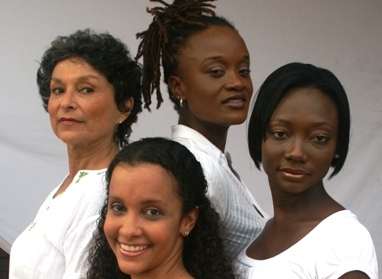 As a pointed social satire which tears at the phobias and stereotypes of many Jamaicans the play allows you to laugh at some of the darker and taboo subjects of our culture through situational comedy while inspiring contemplation on the dichotomy of class relations and generational prejudices that necessitate change and transformation. word medicine forms the second half of TWO for ONE. It segues beautifully and flawlessly from Di Fallen Angel An Di Devil’s Concubine, continuing the exploration of self and transformation. Using poetry, narration, movement and drama to present the works of an array of writers, including Toni Morrison, Mervyn Morris, Lorna Goodison, Trevor Rhone, Maya Angelou, June Jordan, Jean ‘Binta’ Breeze, Patricia Smith, Donald Woods and fabian thomas, word medicine allows the listener to take an emotional and introspective journey through the paradoxical juxtaposition of expressed pain and beauty. This is the second time that fabian thomas is presenting a Two for One package. He mounted the theatrical production in Montego Bay in 2002 to rave reviews and which resulted in an Actor Boy nomination for Fae Ellington’s role in Di Fallen Angel An Di Devil’s Concubine. The companion production then was thomas’ VOICES, which went on to win the Actor Boy Award for Best Revue. TWO for ONE will run from Thursday, January 31, to Sunday, March 2, at the Pantry Playhouse. The talented ensemble of performers includes: Nadean Rawlins, Noelle Kerr, Nyanda Cammock, Kajha Escoffery, Althea Hewitt, Rushae Watson, Dane Richardson, Craig Binns, Lee Patience, Andre Robinson and Brian Johnson.